"How to Save Second Life in Seven Easy Steps" is my latest editorial on Social Times, and I'm gratified to see it garnering a very interesting conversation there. The most curious reaction, of course, is to my suggestion to add an achievement/leveling system to Second Life, primarily to give new users a structure that will ease them into the SL experience in an encouraging and fun way. Sample objections: "That will just make Second Life like World of Warcraft! ", or "I don't want SL to become FarmVille!" At heart to these objections is the assumption that a leveling system is fundamentally incompatible with Second Life, which is such an ahistorical notion, it's worth addressing here. In point of fact, before World of Warcraft launched and FarmVille existed, Second Life did have a leveling system, and had one from very earliest days. Now that growth is slow to stagnant, it's surely worth considering. A user-to-user system won't work, but one that reflected actual activity already tracked on Second Life's servers probably would. (Which is why one of my other seven suggestions is to hire an executive with extensive game design experience, who can create a system that's difficult to game.) And yes, it should definitely have an easy opt-out option for those who don't want it (though I strongly suspect once implemented, few will do so.) Tellingly, Cory Ondrejka, who removed Second Life's original leveling/achievement system, has said he thinks another version is worth trying. To be sure, there's a deeper, philosophical counter-argument to make here: Yes, maybe Second Life did start with a leveling/achievement system, but the lack of one has since become an essential part of SL, making it unique and special in all the Internet. That may be true. But the fact remains that leveling/achievement systems generally work to grow users and user retention, both of which Second Life sorely lacks. So to paraphrase Vincent Vega from Pulp Fiction: Do you wanna continue this theological discussion with several million other Second Life Residents, or on an empty sim? But aren't there 20,000,000 accounts, Hamlet? Oh. Right. Most are alts, bots, or folks who couldn't get past the achievement of learning the basics. Dear God, I remember that ( I was once around #80 on the leaderboard). So, calling cards used to be transferable at one point? I believe you can still give someone a calling card without friending them. I'll check as soon as I get inworld. it WAS compatible in 2002-2003 when SL was an unused- losing money fast GAME.. and when phillip and corey were sitting in empty booths-chairs at macworlds(games section) trying to get "anyone " to try their game. all should READ the gamasutra posts describing the LINDEN products.... nothing about virtual economies, customers, clients/corporate partners etc. etc..
Then as we all know in desperation to keep their "lab" experiments going, LL - employed the "others will build it for us to own" mythos, IF we tell them they "own it or itll be good for humanity" well US humans at least. anyhow-- that "MINOR CHANGE" made all pretence to being a GAME .. unethical... Once they took your INVESTMENT-money and time- in virtual PROPERTY ..they HAD to change .. but they didnt..
they decided to have your cake and eat it too.. and its only taken 4 years for the "sukers---er.. "community" to realize the full reality of the "game". and who was playing what. and the rest of the kids were left on an empty field. I'm sure you will have an invite to Phillips softball question game tomorrow and you can wrap your idea up in a fuzzy softball fan boy question and ask it. Yes, you can still get calling card without friending someone. I remember the day of user ratings. It did encourage me to meet people and try to leave a good impression. I think the achievement system could have multiple aspects. We could rate people as builders, scripters, event planners, most helpful, best fighter, etc. The RP sims have instituted their own leveling systems within the virtual world to create, basically, primitive MMOGs, which are often my major reason to be in SL these days. I don't remember how it started but I can see how irrelevant it has become. And your ideas, Hamlet, I need just to read to fall asleep. Enjoying my first life! "And yes, it should definitely have an easy opt-out option for those who don't want it..."
Anything like this should be opt-in not opt-out. People who don't know about the system shouldn't be included in it automatically. Look at all the problems with Bloodlines players and Facebook privacy issues for examples on why opt-out is the worse of the two options. "Second Life did have a leveling system, and had one from very earliest days." "...the system was poorly implemented, and so while it did encourage user activity and retention, it was also gamed from the start, and led to a lot of social conflict and drama." 'Nuff said (and properly in past tense, too). Except to reinforce: Opt IN, not opt out. To Scree's examples above, you can add the media controls in the first iteration of Viewer 2, which not only made them opt-out but (Facebook style) hid them. In case some of you missed it...reread Lalo's comment. "But the fact remains that leveling/achievement systems generally work to grow users and user retention." In what sense is that a "fact"? Do you know of one single case where a world with no l/e system added one, and thereby increased retention? The only "fact" is that some worlds that have lots of users and growth also have l/e systems. There is the contrary fact that some worlds that have l/e systems *don't* have lots of users and growth. "The only 'fact' is that some worlds that have lots of users and growth also have l/e systems." Actually, *all* the large MMOs/virtual worlds have some kind of 1/e system. I'm seriously not aware of a single exception. It's true that many smaller worlds have them too, but that's a slightly different conversation. It seems like there is an easy way to test this theory. Find an in-world community that has implemented its own achievement system and convince them to share their retention and growth data. After all, LL gave us all of these creation tools so that they wouldn't have to do it all themselves, didn't they? Like Bloodlines you mean? Yes I Love being annoyed by those people. Leveling system? ... like your rez day displayed in your profile? So people can suggest youre a perma-newbie if you weren't born before 2006? Cool. I'm not actually sure what this is, but is it, so people wouldn't need creditcards? So they would need to verify their ID through the ever so popular ID thingie on the SL website, so they could get to zindra to spend their pre-paid fun bucks? It wasnt perfect, but I do believe search worked ok till they made it worse. "In a study by two University of Michigan academics, chat was found to be the primary predictive factor for keeping new Second Life users engaged. Not making money, or exploring the world, but simple text chat with fellow SL users"
..... MMMmmmm so this should actually be #1 on your list of seven then? And your rational for this is to make SL more like the "popular" platforms, like WoW etc, because why? There was a resent attempt to make the SL viewer more like a "popular" web thingie... it has been a failure. It couldnt hurt, but you arnt going to be able to do Machinima in SL that rivals even simple programs like DazStudio for a very long time... Perhaps Just heavily promote SL (as in advertise) to a demographic they know is likely to take up SL would do. And, i would add to that, "that has been a long suffering SL resident"
Its time to stop dreaming about new features and magical fixes for SL, what the Lindens have to do is go to https://jira.secondlife.com and start fixing the problems people have been pointing out for years. They also have to realise they have absolutely wasted most of the last 2 years (and wasted alot of customer good will along the way) and admit it to the world. Tell us again why we should bother? LL will not solicit and then deliver on customer requirements. There is no hope. Not with these kind of obvious paper tigers that know nothing about human computer interaction or human factors in software interfaces calling the shots. @ Ann Otoole Yes I've seen the WEB-1819 search thing on the blogs and i'm disgusted at the way its been handled. Its a pretty good example of why LL is loosing respect. I'm bothering cause i still have friends in SL, thats about it. A few years back, I was looking into virtual worlds/games and each one wanted me to jump through hoops, find this, do that, go somewhere, all to get a gold star for one reason or another. Then, I found Second Life, and it promised me a new life where I could create content, run a business, sell things on line, make money, meet people, all on my own schedule, in any way I chose to do it. I joined Second Life and every day I do what I want, when I want, and I love it. Take the achievement/leveling system to the Teen Grid. They will love it there. The rest of us in Second Life have grown beyond that. There is a version of this already in SL. It is called Tiny Empires (http://www.tinyempires.com/) and gives people titles based on the size of their "empire". Each person can have up to 10 direct "subjects"... and each of those can have up to 10 as well (modulo limits that apply based on rank). It was great fun to socialize using the game. It was also the source of much drama. Then again, drama seems to be the main game mechanic of SL, so why fight it. Of course, it was gamed: people created alts specifically to feed their down line with subjects. While I think the Hypercapitalism SL currently runs on is really its own achievement system, I do remember that two things about the old system really did encourage a lot more involvement with other people, namely that you could get $L cash for making friends and for running events. Most effective though was the pattern of giving out weekly stipends. The amount of the stipends really set a good baseline for people to spend on various goods and services, and the price of things still hews pretty close to that to this day. caveats yada yada like diminishing returns, limiting the achievements to verified accounts, number of alts, etc., limit the number of achievements per week, you get the idea. sounds fast easy and fun? One thing to consider is that a lot of us did whore around at the Visitors Centre to get calling cards, but we actually did MEET a lot of people, too. We became good friends, mentored them and watched them in turn start creating and doing amazing things. I treasure the friendships I made with George Busch, Fleabite, Candy Apple, Sinatra Cartier, Lynn Lippman, Cristiano, Garth, Pituca, Soren and Eggy back in beta. Maybe it's me but we don't seem to get excited when we discover new textures or a build or new stores now. I never get IMs saying "OMG! Come to the sandbox NOW!" Meeting people no longer engenders the wild bouts of creativity we used to know. i remember an old land baron complaining about the lose of her carefully cultivated reputation. over night she went from a respected member of the community to just another suspected adfarmer/cutter/rent gouger. And there was I thinking that one levelled up in SL by making interesting creations, making friends and connections, writing on one's experiences, giving seminars and interviews, all that sort of thing. Would I now have to kill ten wolves and bring their pelts back to someone with an exclamation mark over their head? @David Cartier: In my research, I have come across all those names you mention, listed in their builds which still exist -- and though I will probably never meet any of them, I feel somehow connected. But let me ask: In those far-flung days of SL Beta, how many total Residents were there? How many online at the same time? I already know how many sims there were -- on Opening Day, there were 47. I understand the small-town nostalgia (virtual archaeology has made me wish I had been there then), but reviving an idea abandoned years ago will not return that feeling to a world with 50,000+ concurrent users (median) spread across almost 32,000 sims. To borrow a phrase we heard a lot last year, "It doesn't scale." On the minus side... The Sims Online had a user rating system, and it was one of the factors in that game's untimely demise. The system empowered the rise of the TSO 'mafia', gangs which extorted in-game money from residents under threat of trashing their reputations. On the plus side... an achievement system doesn't have to incorporate user ratings at all, and it's probably better if it doesn't. I think what we're seeing here is the age-old conflict between Bartles' old MUD archetypes, specifically the Socializer and the Achiever. Socializers sneer and look down their nose at achievers, somehow thinking that their own amorphous social hierarchies are superior. Achievers laugh at socializers because in gaming terms, socializers are lame noobs who never amount to anything. And we who lean towards the Explorer/Creator archetype have an unattractive tendency to treat the rest of the world as slow, unruly children. The fact is, you need all the archetypes (with the exception of Killers, who will show up anyway regardless of how you try to supress them) for a healthy social ecosystem. Concentrate too much on any one of them, and your virtual world is unbalanced. One of the reasons I'm not actively playing Second Life at the moment is that I'm bored to tears with talking (my tolerance was never that high to begin with). The interface for making things is crippled and unrewarding, and there's no infrastructure for achieving. 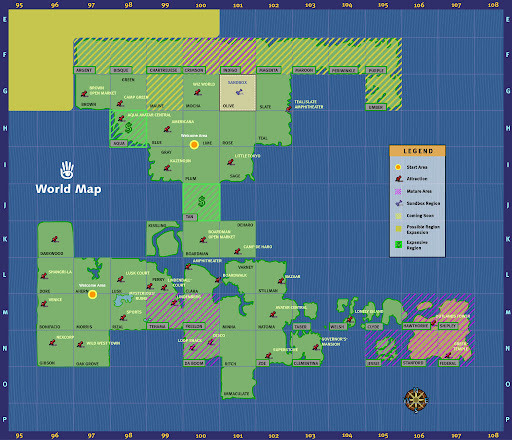 Second Life should be split into several worlds. Those who want fantasy and those who want reality. Those who want to play a game and those who don't. Isn't there an easier way? Why not just provide a platform and let sim owners develop sims along the lines that most interest them and their target market? Isn't this the existing case? LL needs to focus on improving the platform so that users can do anything they want to do with their sims. I'll say it again. Hamlet, I sure hope the Lindens aren't listening to you. You are too immersed in the virtual reality game world. Do you realize how SL is changing? I am inviting people to join SL who have no interest in playing a game and in fact find it ridiculous that people use avatars. They would only join because I am promoting SL as a serious place where people can do serious things. They leave fun to RL. Think about this would you.